WP Event Manager Plugin is new plugin with over 100+ installs as of 5/20/2017 and climbing. Short explanation of this plugin is that you can ultimately create event listing functionality for WordPress blogs. This free plugin has a lot of features and looks very promising. I took the liberty of installing the plugin on a test blog of mind to show you how this plugin works. In this blog post, I am going to talk about and show you most of all the features but will walk you through how to use this plugin so you have a very clear picture if this suites your needs. The WP Event Manager plugin has some add-on’s but they are paid ones. This post is only about the free version. Here are all the features that the free version provides and it’s a lot. Cross Browsers support (Firefox, Chrome, Safari, Opera) – Internet Explorer is dying, use on of the following browsers. 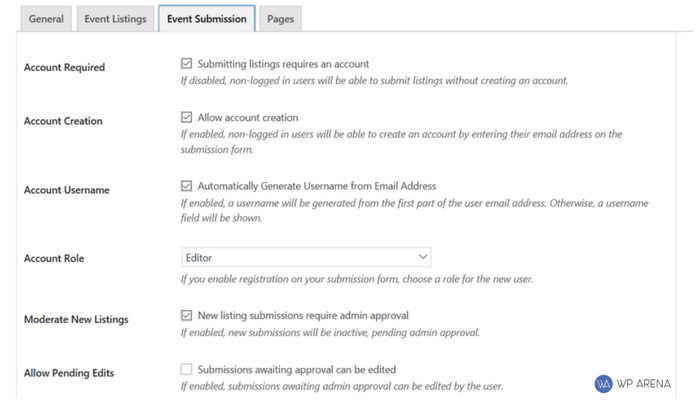 Add, manage, and categorise event listings using the familiar WordPress UI. Frontend forms for guests and registered users to submit & manage event listings. Each listing can be tied to an email or website address so that attendees can register to the events. There is another page of add-on’s to share but I think you get the point that this plugin was well thought out before launch and you can assure it will get improvements to the free version and more paid add-on’s created. Lets get into the install/ setup of the plugin. This is where I will walk you through some features with screenshots. Click on the “Continue to Page Set Up” button to get starting with the initial set up of this plugin. On this next page, you can start to customize the plugin step by step which means less work in a way. Of course you want this plugin for a specific reason so at the end of this blog post, you should understand this plugins capabilities. I am not going to make any changes on the page above and just click the “Create Pages” button to have the automation done in a matter of seconds. This creates new pages in your admin dashboard. Before looking at them and tweaking them. WP Event Manager gives you tips on what to change next. I like this, just follow the steps and this will ensure you didn’t miss anything. Before using the plugin for what you want to use it for, let’s go ahead and tweak the settings. You do not have to copy off the settings I have selected because you may want to do something different. I’m doing the work for you and providing real screenshots so you can decide if this plugin fit’s your needs at the end of the post. Did I mention that I really like this plugin? Leave both settings checked. Don’t know what BootStrap is? Please visit this website Bootstrap Get Started to learn a lot more. Web developers know it’s importance but us regular bloggers should know it’s worth having enabled if a plugin provides this option. Next page is selecting which features/options you would like. This can be changed at any time in the future. Here is a working Demo Version of this plugin. The last set of settings to configure and the rest is up to you. Handling events can sometimes get a little messy if you are not selecting the correct features or even how you word things. It’s a great idea to use this event plugin which saves you and your customers time. Although Event Manager works great as a free plugin, it also has many more features which are paid add-on’s. When you have a few dollars to invest online, think about purchasing an add-on because there are a lot and each one serves a specific purpose to help your blog out. This plugin can be used with any WordPress theme, this means when you change your theme, there will be little changes to make to the events created. I would suggest you check everything you set up with a new theme. If you are interested in WP Event Manager plugin, you can get it free on WordPress plugin repository or check the official site for more info and documentation. could you please add a “save as pdf” or “send this expert advice to email to friend option on these pages?